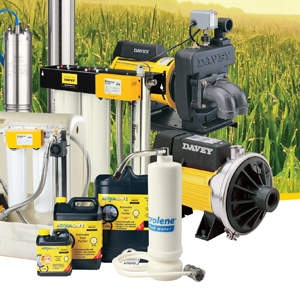 For over 80 years, Davey Water Products has been manufacturing products that help protect and enhance people’s lives.Traditionally servicing the domestic water pumping, water treatment and swimming pool & spa markets, Davey has in recent years expanded its focus and product portfolio to include the commercial pumping, irrigation and commercial pool markets. Backed by specialists in our commercial team, we can also design customised systems to suit project requirements.Whether you need perfect pressure, healthy drinking water, protection from fire and flood, a clean, relaxing pool or spa or water to run your farm or business, you can depend on Davey. Davey works to Lean practices, is an ISO 9001 Quality Endorsed Company and been certified to ISO 14001 for our Environmental Management System. Learn more about Davey Environmental Policy.